"We invite you to relax and settle into your meal with "Today's Temptations,"
which is an array of delicious "small" bites to be shared by all at the table. 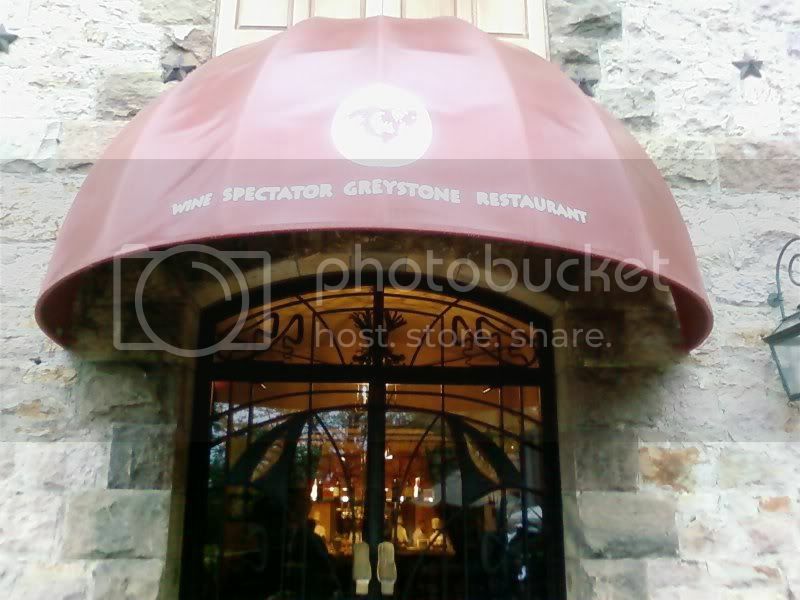 The Culinary Institute of America is the United States crowning glory of a culinary school. It churns out hundreds of petit chefs in three locations (Hyde Park, NY, San Antonio, TX, and St. Helena, CA) each year. Being a graduate of Le Cordon Bleu myself, I jumped at the opportunity to visit a rival school's restaurant. The restaurant of any culinary school is an exciting place to eat and to work. Many schools allow senior-ranked students work in the restaurant for a period of time for graduation credit and sometimes it is a culinary student's first experience working in a restaurant. Nevertheless, gourmet dishes and presentations are available to customers with discerning and curious palates. If there is a culinary school anywhere near your area, call to find out if there is a restaurant. It will give students practice and give you a chance to eat some great food. All that said, this restaurant had a lot of hits and misses. I have to touch them all. I was disappointed to find out from our waiter that this restaurant is not run by students. 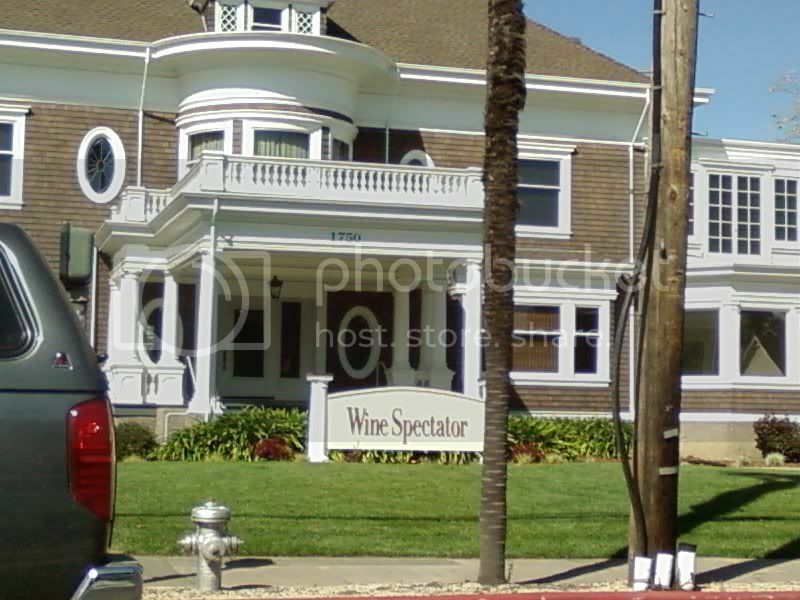 It's a professional restaurant created in a partnership with Wine Spectator magazine and the CIA. Everyone who worked there is a full-time employee, he said. By the look of everyone's young face, I assumed the opposite. I asked if the students came to work in the kitchens of the restaurants and his response was, "We let them come in for a few weeks near the end of their time at the school." Upon further investigation, the school does not have a restaurant, bakery, or even a minuscule cafe for the public to taste to wares of once and future culinarians. After that severe letdown, I perked up at the prospect of superb food. It's an open kitchen so all activities and conversations carry into the dining room and vice versa. The kitchen and bar area were in a furied frenzy on this early Friday night. 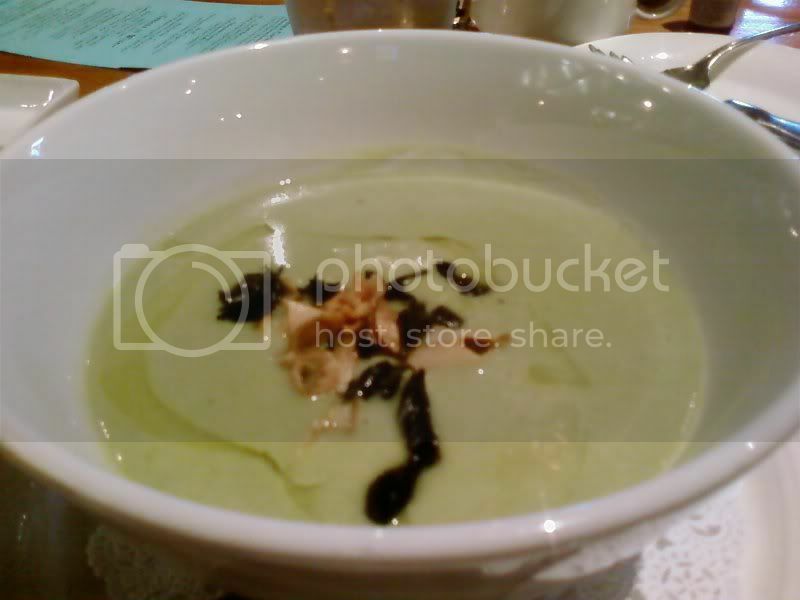 Our first course: a spring garlic soup with black trumpet mushrooms, crispy sunchokes, and lemon oil. This was one of the highlights of the meal. This day was cold, rainy, and dreary dusk had started to set in. The creamy consistency of the soup coated our palates; the sunchokes (also known as Jerusalem artichokes) and trumpet mushrooms provided a great texture contrast to the otherwise flawless soup. The lemon oil seemed to be an afterthought that did not detract or add to the overall flavor. On a second glance of the menu, I noticed more oysters. We declined. Because of the poor showing at COPIA we did not want to be disappointed again. Indian spiced chickpeas. 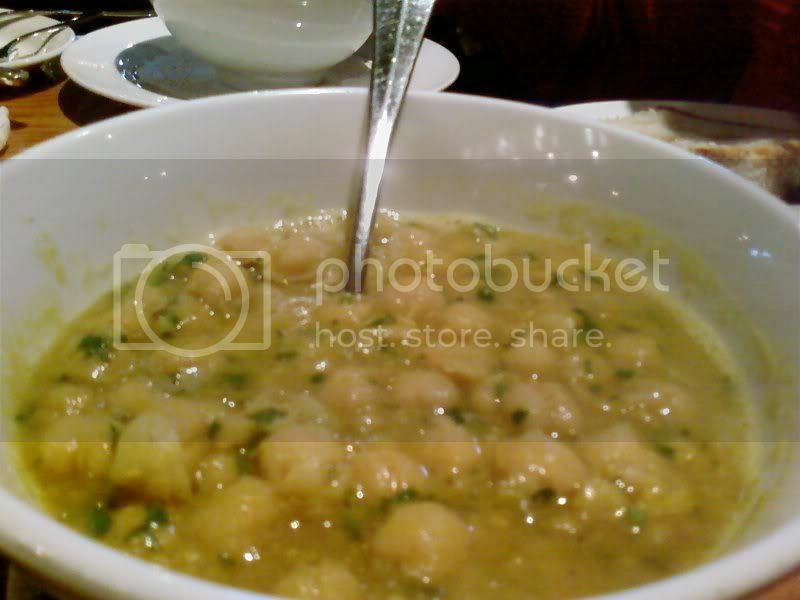 The best set legumes I ever put into my mouth. The bowl was full, steaming, hot, and luscious. I wanted to fall into this sea of garbanzos and stay. Luckily, we brought Beano along with us because we couldn't get enough mouthfuls of garlic, coriander, cumin, fenugreek, peppers, and other spices I couldn't readily identify. 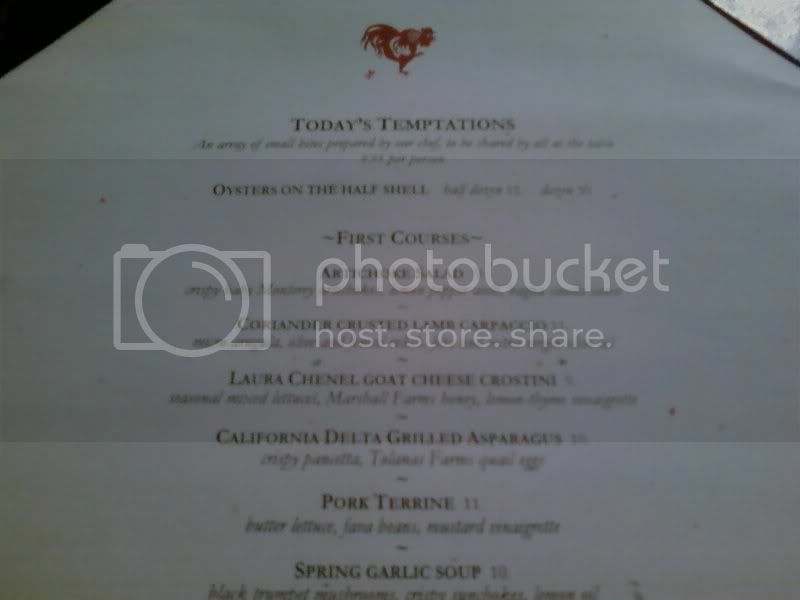 According to the menu, I ordered harissa marinated quail with preserved lemon date couscous and sauteed arugula salad. I substituted the couscous for sage späetzle (I'm not partial to preserved lemons and I wanted to semi side-step heartburn). Harissa is a very spicy and hot North African/Middle Eastern red sauce made from smoked or dried chili peppers, garlic, sometimes tomatoes, coriander, cumin, and caraway seeds. I have Creole blood and I crave all things spicy. I was expecting a tender quail with a crispy, fiery skin. "We don't like to heavily spice our food here." "Well, you don't have a problem with salting your food. Can I have another with no sauerkraut and more harissa? I ordered this quail because I thought it was to be spicy. As a matter of fact, please bring some harissa on the side since you don't like to spice your food here." Instead of new pieces of quail, they re-fired my same pieces that I had poked, prodded, and chewed upon. I assume they attempted to add more harissa, but it looked the same, just a bit darker. The second plate was greatly improved (as was my morale) with the addition of heaps of harissa. 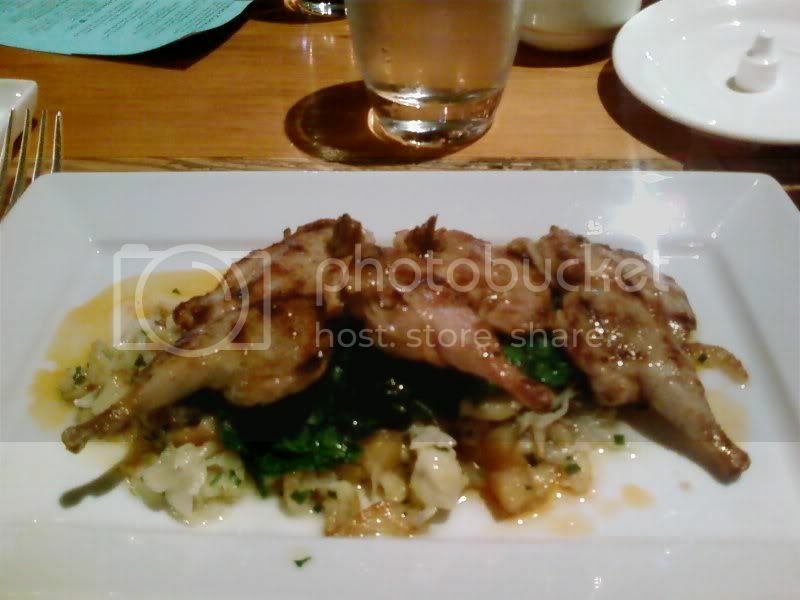 According to the restaurant's Website, that night they served Grilled Tolanas Farms Quail with a harissa vinaigrette. I believe that is what I received. Our waiter did not offer any wine suggestions or perform any tasks outside of the perfunctory duties of a waitstaff. There were young gentlemen who filled our water glasses and bread basket with gusto; With more aplomb than our tin man of a waiter who was supposedly working for tips. I HATE oversalted food. Salt is the one thing you can taste even if you're a smoker with a shot palate, yet so many people f*** up the salt. Stupid that those guys didn't get that you were just subbing the starch and the gave you the full German suite to go with your..... African? F***ing amateurs.